It’s India month at the Sheffield Popular Fiction Reading Group, and my report on Talbot Mundy’s King of the Khyber Rifles can now be read online on the group’s blog. Like Buchan’s Greenmantle, also published in 1916, this is a story about one man sent to combat a Turkish plan to inflame the Empire’s Muslims into revolt. It’s a wild and sensational tale, with echoes of Kipling and Rider Haggard – and occasional pre-echoes of Indiana Jones. You can find a Kindle version of the novel free at Project Gutenberg. I’ve put another Talbot Munday book onto my ever-lengthening to-read list. Hira Singh : When India Came to Fight in Flanders. 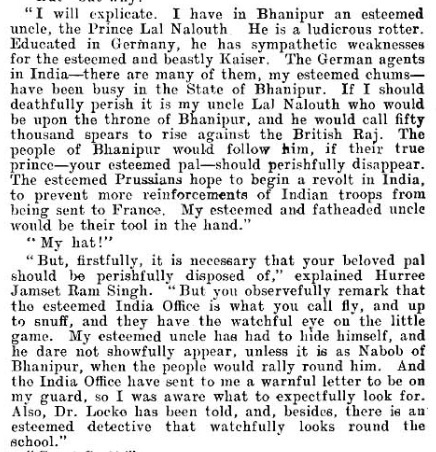 (1917) This is about an Indian regiment captured in Flanders, and sent as prisoners to Turkey, from where they escape and make their way back to India. That’s the earliest book I know about Indian soldiers fighting in Flanders. I started to wonder whether there was any fiction about Germans or Turks trying to undermine the Empire before 1916, and then remembered that I’d read one in connection with my current research. You’ll be relieved to hear that the rotters don’t get away with it. This entry was written by George Simmers and posted on November 3, 2015 at 5:44 pm and filed under novels, popular culture with tags Greenmantle, Hurree Jamset Ram Singh, King of the Khyber Rifles, Magnet, Talbot Mundy. Bookmark the permalink. Follow any comments here with the RSS feed for this post. Post a comment or leave a trackback: Trackback URL. There’s also a 1915 novel by Mundy, Winds of War, about a German attempt to undermine British rule in India. Yasmini appears in this too, as does Risaldar-Major Ranjoor Singh, who then reappears in Hira Singh: When India Came to Fight in Flanders. I look forward to hearing what you think about Hira Singh – I think it’s the most interesting of the three books. Thanks for the tip about Winds of War. I shall definitely take a look at Yasmini’s backstory. I am an Indian, I consider myself an avid reader, yet I have never heard of any of these books. Thank you for the blog post, I am going to put these books on my to-read list as well. Very little fiction about India Army under the british is popular here in India. I am sure these would make for an interesting read. When you’ve read one, do let us know what you think. I’d be interested to know how these stories strike a modern Indian.